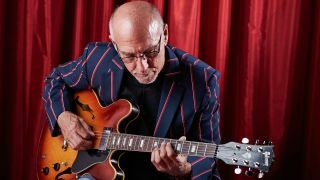 Session master and consummate soloist Larry Carlton is on every player’s list as an icon - we examine the origins of a phenomenal musician. Listening to some of the solos he’s played in the past, Steely Dan’s Kid Charlemagne being a fine example, might make you think otherwise. But, despite a celebrated career as both sessioneer and soloist with his own bands, not much is known of Larry’s origins and the foundations upon which much of his later work has been built. “Obviously, I started from scratch - I was six-and-a-half years old, so he’d show me all the basic things that a teacher would start with: the names of the strings, how to hold a pick, how to hold the guitar, a whole note on a staff. “Go home and practise that. Those kinds of very basic things and then, as we progressed, he could see that I had an aptitude for playing and so I don’t know how long after - six months or a year - he made sure to make the lesson fun, which my mom reflected and told me about later. “I don’t really remember the first guitar record that struck me, but I do remember that every Saturday night on television in Los Angeles there was a country music show called Town Hall Party and Joe Maphis was the guitar player and Larry Collins and his sister Lorrie were the kids on the show. 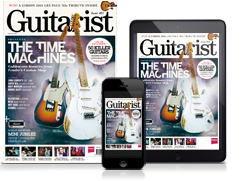 “I did learn Mr Sandman in the style of Chet Atkins, after hearing it a number of times. Chet did not have an influence on my playing, except I was aware of how to do that style in case I was asked to do it. I could imitate it. I didn’t know many records by Chet; I was more taken the other way, more jazz players. “I first heard Joe Pass on the Moment Of Truth album by Gerald Wilson [from 1962]. He was the featured soloist and his solos just made so much sense to me. In my opinion, in my observation, they were at a whole other level than what I had been listening to with Barney. So, that’s when I discovered Joe and I bought that album. “In junior high school I was playing three nights a week on the weekend with older musicians at a supper club - five shows a night. I was playing all the pop tunes of the early 60s and that kind of experience, at such a young age… I remember celebrating my 15th birthday at the club! I wasn’t driving yet. “Out of high school I had my own trio, so for the first set at the club we could play jazz, and after that we played pop music so people could dance. Again, I was still progressing at playing; we’re looking at 12 or 13 years that I’d been playing guitar and I was only 18. “There was Hal Blaine, Joe Osborn, Larry Knechtel - all the big boys - and we were doing cover tunes: there was Tequila, Memphis [Tennessee]… That was really my first experience of being in the studio at that level. “Upon reflection, I realise that Richard hired me because I could read, but also because I still sounded very young, so I wouldn’t sound polished but the record would have enough authenticity to it of a band. That’s my take on that. But that experience was my first time being in the studio with the big boys. “That was the next step, but I was meeting players who, every once in a while, got calls for masters. They talk to their people: ‘I met this guy, Larry…’ and it was word of mouth that got me started… But let me back up one more place. “I got a call from Dumble or someone, saying, ‘Do you want to come and see the amp tonight?’ I’d never played one before, so I went to Dumble’s place and Eric Johnson was there, playing through an amp.